Gareth Evans’ Apostle is The Wicker Man, "Safe Haven" and Silent Hill thrown into a boil that bubbles over during a ruthless third act that certainly delivers if you have the patience. Gareth Evans’ Apostle is a slow-burn detour around the director’s bruiser action sensibilities (The Raid franchise). More a feature reimagining of “Safe Haven,” that wicked cultist V/H/S/2 segment Evans co-directed with Indonesia’s Timo Tjahjanto, with a heavy emphasis on “slow-burn.” At 129 minutes, Evans explores a secluded hideaway settled by escaped “traitors” and overseen by a female goddess. Themes toy with sacrifice, blood donation, and a mother’s nurturing strength. It’s at times terrifying, at times plodding, but altogether a chill-worthy tale of revenge, discovery, and blind devotion to steadfast faith (that I wish Netflix would release in theaters because wow does the cinematography impress). Dan Stevens stars as Thomas Richardson, an ex-priest and brother who must invade a naturalist cult to save his kidnapped sister. All Prophet Malcolm (Michael Sheen) wants is a ransom payday from Thomas’ father, but the furious son is not there to pay off ill deeds. As an escape plan hatches, Thomas tumbles further into the congregation’s beliefs and practices, including sanguine offerings of red bodily juices. Something is wrong, and Malcolm’s daughter Andrea (Lucy Boynton) doesn’t hide that. Thomas must withhold sanity if he’s to find his sister and flee from the landlocked community, but such a task doesn’t come easily once a Mother Earth deity makes herself known. 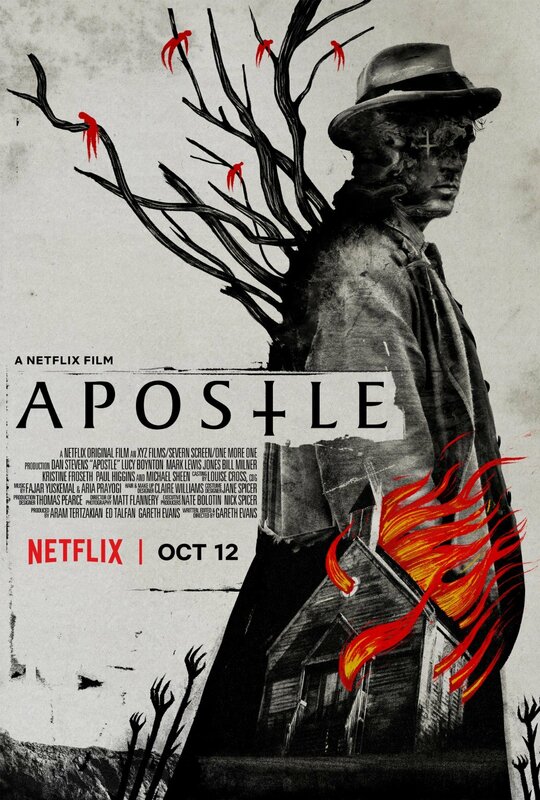 Apostle is The Wicker Man, “Safe Haven,” and Silent Hill thrown into a blender. Evans sticks to no single plan. As acts play out and cinematic feel shifts with the changing winds, a kitchen-sink occult barrage periodically assures no possible explanation for actions. Such may be the exact reason why followers flock towards Apostle or shun it, but trust that Evans’ shying away from fight choreography leads to a test of many subgenre devices. Malcolm’s guidelines, a magical woodland giver locked away by worshipping settlers, Thomas’ conversion attempts, archaic torture devices – Evans has many sights to show you, and there’s no backing down. Speaking of sights, the work of cinematographer Matt Flannery twists and pans as if his camera is part of the island goddess’ viny outstretched arms. Apostle is glorious to behold, from chalky cliffside walls to bamboo fields to a Chinese aside that sets the screen ablaze with borderline apocalyptic intent. Blood reds splash atop leafy greens and dull colonization simplicity with scenic ferocity. Evans’ direction and storytelling aren’t to be forgotten, but what impresses most is the film’s ability to convey tone through visual representation. As flames engulf and caverns explode rocky debris followed by the island’s own gushing blood – like a human – macabre beauty demands attention to every overhead, framed, and calculated lensing accent. Also on display is campy, bug-eyed, off-the-chain Dan Stevens in full force. As Thomas comes face-to-face with evil while swimming in a claustrophobic blood river tunnel, or as “Twig Mask Pyramid Head” cranks a lever pulling him closer to an iron meat grinder, Stevens’ rage and flight-or-flight resistance unleash a most emotive performance hidden behind piercing glares. Sheen’s “villain” tends to his herd with condemnation of blasphemy and charismatic “praise be” rhetoric, Boynton injects needed sanity, supporting performances smile and nod with unsettling loyalty, but Stevens’ doped-up rescuer carries a tremendous performance weight. It’s simply further proof that the former Downton Abbey star’s decision to exit was only for the best. Circling back to Evans and Apostle’s production, expect genuine standout moments where tension bursts wide-open to reveal graphic, pure-terror unspeakableness. Once such display appears above – Stevens wading through discarded remains as an old hag pursues – and that’s not all. Bill Milner’s young lad faces drillbit purification, the island’s goddess wretches and squirms in her constricting thicket, Stevens randomly knows martial arts and brutalizes some guards – it’s certainly not mile-a-minute, but Evans delivers on impactful imagery more than a handful of times. Religious allegories, dangerous harvest festivals, dim mine shafts where bones float and a supernatural being feeds – when Evans gets there, he goshdarn gets there brandishing sharpened spears. There’s more to Apostle than meets the eye, which is both a plight and saving grace. Gareth Evans experiments with some nasty “mother’s love” folklore to warp life-giving and rebirth touched by sinister lips. There’s a slicker, more trimmed-down movie here that succeeds on a higher level without *so* much universe tampering, although we’re talking about a “good” movie becoming “great.” Take that “complaint” how you will. It’s Dan Stevens vs. Michael Sheen for heaven’s sake with infinitely more surprises in store. No beating around the bramble, you’ve got an easy choice once Evans’ latest hits Netflix.